Menulog delivers for The Thai Mascot (Halal) so you'll be able to track your courier on a map. Thick rice noodles with chilli and basil sauce. Egg noodles with oyster sauce and vegetables. Thai style mild but flavoursome fried rice with vegetables and meat of your choice. Chilli, basil and vegetables. We recommend customers to have our fried rice topped with a fried egg. Tom Yum/ tangy flavoured fried rice with vegetables and herbs. We recommend customers to have our fried rice topped with a fried egg. Thai Style broth with thin rice noodles and green vegetables. King prawns with snowpeas or seasonal vegetables. 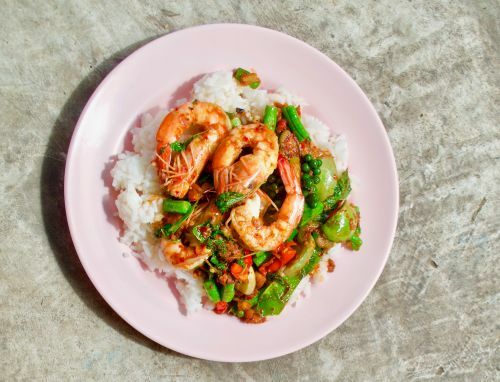 A sweet and salty filling with Thai veggies and grindpeanuts. Wrapped in golden pastry, served with sweet chilli sauce. Deep fried crab claws served with sweet chilli sauce. King prawns marinated with soy sauce and pepper, deep fried with our special batter and served with sweet chilli sauce. Marinated grilled beef roared with flavor. Served with Thai Mascots secret sauce hot enough to bring tears to your eyes. "All Seafood Stirfry dishes do not include rice. ""Extra Seafood will be $5.50""Extra Prawns will be $5.50"
Choice of fish filets or king prawns stir fried in shoo chee curry paste, coconut milk, vegetables and Thai herbs. Wok style curry with mixed Seafood Stirfry with Crunchy fish filets, king prawns and squid. Squid and vegetables stir-fried in garlic and pepper sauce. Hot chilli, fresh garlic, basil and vegetables. Fried rice with egg and garlic with bits of vegetables. Thai Mascot's famous egg fried rice with bits of vegetables. Thailand's famous sweet and sour noodles with egg, tofu, bean sprouts and crushed peanuts. Skewered tender pieces of marinated chicken, slowly grilled. Served with satay sauce with a bed of Egg Fried Rice. Mushrooms, galangal and herb soup with a dash of coconut milk. Hot and sour soup with mushrooms enhanced with lemon grass, lime leaves and lime juice. A spicy seafood soup with prawns, squid and fish. Enhanced with lemongrass, lime leaves, basil leaves, lime juice and chilli. Slices of beef in a salad of tomatoes, onions and herbs with a tangy lime dressing. Slices of chicken in a salad of tomatoes, onions and herbs with a tangy lime dressing. Slices of lamb in a salad of tomatoes, onions and herbs with a tangy lime dressing. Minced chicken in a salad of herbs and ground roasted rice with a spicy dressing. Minced beef in a salad of herbs and ground roasted rice with a spicy dressing. Squids with lime juice, chilli, onion, mint served with garden salad. Prawns in a mixed herbs salad with a tangy dressing. Seafood in a mixed herbs salad with a tangy dressing. Home made traditional satay sauce - Thai Mascots secret recipe! Organic grown green tea leaves featuring the original Japanese green tea at its best. Organic grown green tea leaves featuring the original Japanese green tea at its best - Honey and lemon flavored. A perfect combination of Soymilk and Black Sesame (100% vegan).